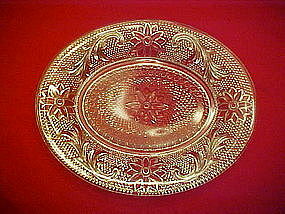 Pretty little platters in Tiara's crystal sandwich glass pattern. Made by Indiana glass. The pattern has been discontinued, as well as Tiara has long since gone out of business also. Each measures 6 7/8" by 8 3/8" oval. This pretty lacy pattern looks well with most vintage tableware and sets a pretty table. I have other pieces available in the catalog. There are 5 of these available, price is for each. All are perfect!